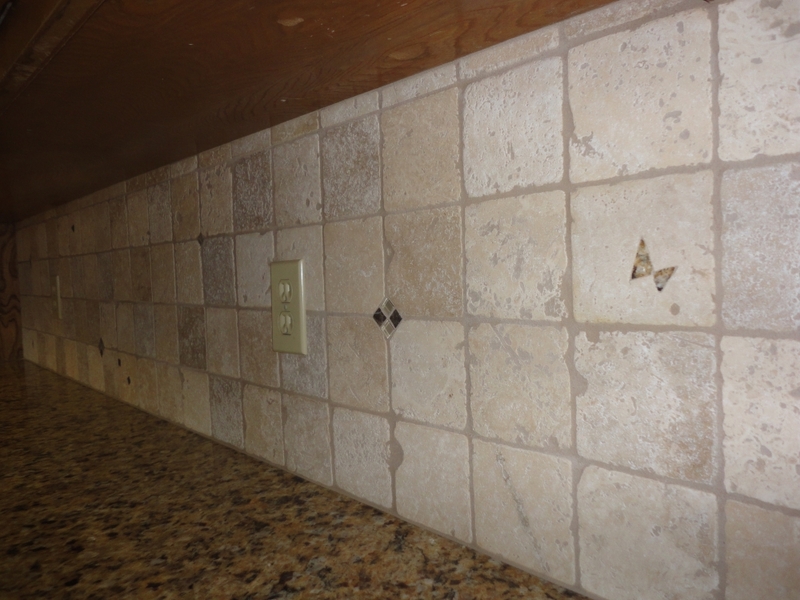 I recently sealed a tumbled travertine kitchen backsplash using 511 Impregnator from Miracle Sealants. I want to tell you how easy the job was, how well the product works and how to use it. I’ve been recommending 511 Impregnator for years. 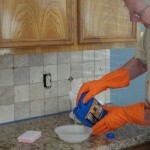 It is sold in Home Depot stores (in the tile aisle) as well as in tile and stone supply houses across North America. 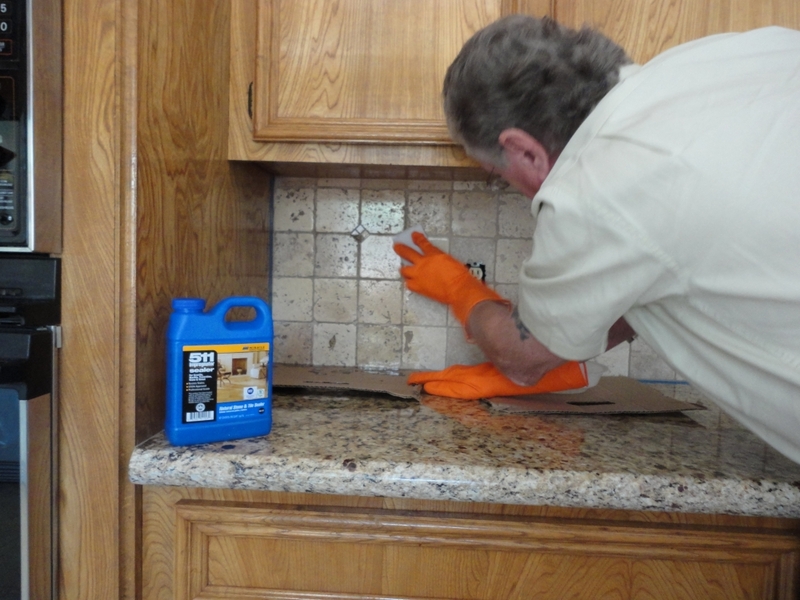 Miracle Sealants makes a full line of sealers, cleaners and protectors for every type of tile, dimensional stone, grout and other porous materials. 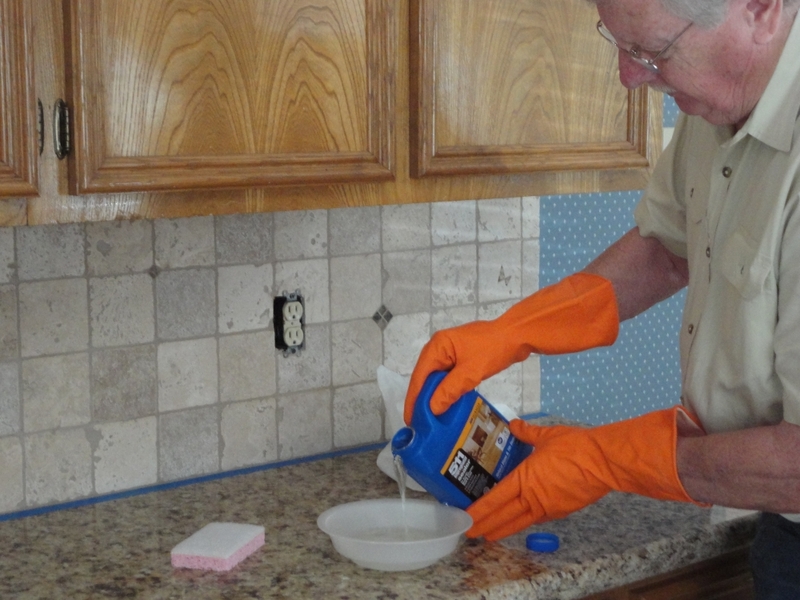 511 Impregnator works by setting up a dirt, grease and water barrier just under the surface of the tile or stone. It’s super easy to use and just about foolproof. The only way you can goof up the job is by allowing the material to dry on the surface being sealed — and even then you can remove it by applying more sealer and wiping with a clean dry cloth. 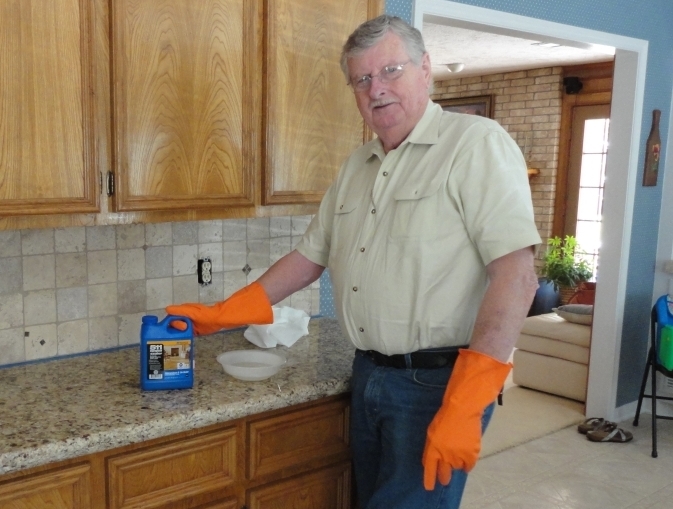 To do the job you’ll need a shallow container to pour some of the sealer into, a small sponge or white cloth, rubber gloves and masking tape. Miracle makes a complete application set that you can purchase at reasonable cost. You will also need a clean white cloth or white paper towels with which to remove excess sealer from the surface of the material you are sealing. Provide plenty of cross-ventilation. 511 Impregnator does not emit a strong odor, but you should still avoid using it in an enclosed space. 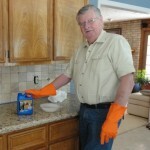 Wear the rubber gloves, although limited contact with your skin will do no harm unless your skin is highly sensitive. Peel back the label on the back of the bottle to expose the directions and precautions. 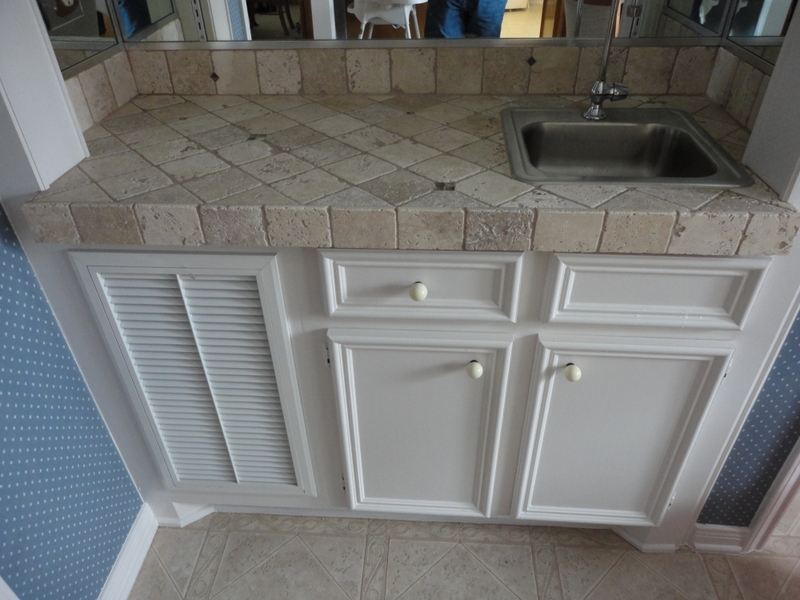 I began by running a strip of masking tape on the countertop close to the caulking that separates the splash from the top, and also to the cabinet on the left where it abuts the tile. I also employed a couple scraps of cardboard, one to slide along the tape as I progressed and the other to set my sealer container on. The sealer will not harm granite tops (in fact, it’s good for granite), but any sealer left on the surface must be completely wiped away. The cardboard would help preclude contact with the top. I would later wipe the entire counter with a clean white cloth. Next, I poured a couple ounces of sealer into my small container and put the lid back on the bottle. It’s easy to add sealer to the container but a little harder to pour unused product back into the bottle, so take it easy on the pouring. And remember that Miracle Sealants has a tricky little applicator and container that makes applying the sealer just a bit easier. My method works, though. 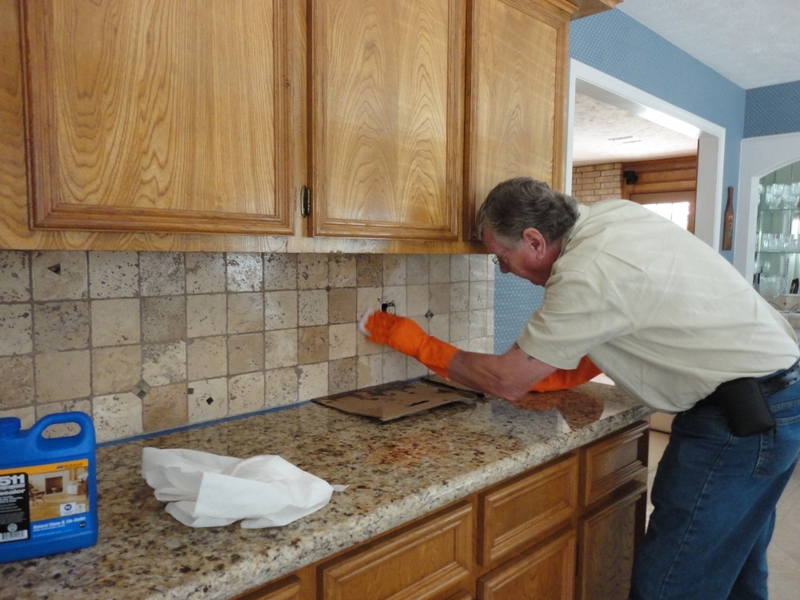 I began on the left end of the backsplash by dipping one end of my sponge into the sealer, letting it drip a little and then applying it to the tiled surface, being careful to avoid smearing it on the adjacent cabinet. 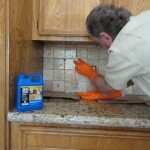 Sealing tumbled stone is a bit more difficult than sealing smooth tile with smooth, even joints. 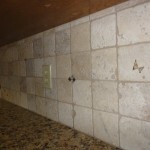 The travertine tiles I had used for the splash were rife with holes and fissures that I filled with grout. The joints themselves were uneven and irregular due to the tumbling of the pieces. I wanted to make sure all the grout was saturated. Travertine stone itself is rather dense and won’t accept much sealer. So I more or less worked one or two tiles at a time. It is important to not allow the sealer to remain on the surface until dry, though. Miracle suggests allowing it to “dwell” for three to five minutes. The surface must then be wiped with a dry white cloth to remove any excess. 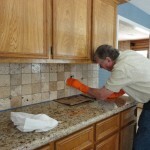 If you should allow a spot or two to dry, you can remove it by applying more sealer and then wiping. So for inexperienced users it is probably best to do smaller areas, say 4 to 6 square feet, and wipe the surface before moving on. I moved along, paying attention to the grout joints particularly. I was careful to keep the countertop clean by using my pieces of cardboard and wiping up as I moved them along. I wiped the surface of the tile installation about halfway through the approximate nine-foot long splash, then continued applying sealer. I would say the entire run took about 10 minutes from start to finish. I removed the tape and wiped the surface of the splash and the countertop with clean white paper towels. It is important that you not use colored cloth or anything that has dye in it, as that might transfer the color to the tile. I stepped back and surveyed my work. I looked at it from different angles to detect any areas of buildup that I might have missed. 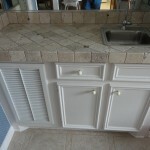 I then went on to the other segments of splash in the kitchen and finally to a small wet bar area in which I had tiled the top with the same stone used on the splash. I’ll show you a few more pictures.